Videogames aren't movies, so what's with all the realistic characters? What you are about to read has been written by Mr Biffo, the creative force behind the 90s Teletext videogames magazine Digitiser. He now runs the show at digitiser2000.com. Imagine a playground. In that playground is a see-saw. On one side sits Lara Croft. At the opposite end is Rico Rodriguez, the protagonist from Just Cause 3. As usual, Rico is drunk, and letting off fireworks. Balancing the two at the pivot point is no less a figure than Nathan Drake, from Uncharted, cracking jokes, and flashing his most charismatic smile at Lara, while she sits there shivering, and complaining about the cold. If you peer just behind the swings you might see Big Boss tying some balloons to a bench. This is the playground of video game narrative, a place where all are welcome. Unfortunately, in recent years it has become overrun with big kids from the estate. The ones who all stand around trying to look grown up, smoking cigarettes, and looking at the little kids playing and having fun. They stand there and roll their eyes, and go "Cu! They're, like, so immature". And recently – for those of us fortunate enough not to be locked out by Microsoft's Xbox One exclusivity deal - we saw Rise of the Tomb Raider. This is the sequel to the 2013 reboot, which gave Lara Croft the backstory demanded by all of us, in much the same way we didn't clamour to hear about Pac-Man's struggles with pharmecuticals and the ghosts of his past. That said, Lara's reinvention kind of worked in the original reboot; I got that this vulnerable young girl had to learn to survive on her own terms, without the paternal safety net. Somehow – for this writer at least – the Lara Croft of Rise of the Tomb Raider came across like a bland, whingey, psychopath. "Hmmm, yes, it's some sort of scroll," she'll monotone while scrabbling around in the dirt. And in the next breath she'd be gouging someone's eye out with the business end of an arrow. Narrative dissonance is what all the cool kids are calling this gulf between video game story and video game action. It had never been an issue for me – not least because once upon a time all the story you ever got in a game was "All your base are belong to us" . Somehow in Rise of the Tomb Raider it finally started to grate on my craw. The industry seems needlessly obsessed with wanting to flesh out our video game characters. Where 3D was one the buzzword of the industry, as far as the visual dimensions went, now it's all about making the characterisation three dimensional. Ultimately, I'm torn. Games don't need to be dumb. We should all strive to make them as smart, and as witty, as possible. An action movie will undoubtedly resonate more if it's stuffed with ideas, and well-realised characters, and twists, and turns. Without that you get, well, the Tomb Raider movies. But an action movie is not the same thing as an action video game. Inevitably, unless a developer goes out of their way to create a non-lethal experience, the characters in a video game will embark on a campaign of mass-slaughter. They will be shot repeatedly, fall into ravines, and be flung through walls. And then they will get up, and do it again, without a hint of bones broken, or post-traumatic stress. The more you strive to make your character realistic – either in the cut scenes, or by having them grunt and groan their way through levels (only for that to drop away the second an enemy presents itself) – the more you draw attention to the incongruity. Barely a month after Rise of the Tomb Raider we get Just Cause 3 – a flawed, shallow, game by anyone's measure – but it crystalised for me exactly what my issue is. Just Cause 3 revels in its videogaminess. It wouldn't work as a movie, and has no pretensions to being a movie. 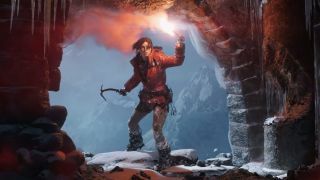 Rise of the Tomb Raider does, but if you put it on the silver screen it'd be a hard 18 or R; Lara Croft might be the victim in the situation, but does she really need to jam her climbing axe in so many skulls? Audiences would be the ones left with PTSD. Grand Theft Auto V got around all this by making at least two of its central characters arguably insane. In that sick, grubby, world, who wouldn't go on a rampage of slaughter? In The Last of Us I bought it because I bought into Joel's desperation to keep Elly alive. The stakes were sufficiently high, the world sufficiently broken, that I was with him every step of the way. Conversely, Fallout 4 may be set in a similarly post-apocalyptic world, but its arguably compelling opening sequence – which gives your character a strong motivation – falls apart the second you start wasting your time on other characters' problems, and trying to build sheds. Maybe it doesn't matter to anybody but me. Maybe it's not an issue, but sometimes I just wish developers and publishers would have more confidence in their games, without misunderstanding what makes them sophisticated and smart. If I want a game with big character scenes I'll play Life is Strange. If I want a movie I'll go to the pictures. If I want to shoot aliens I'll play a video game.